Today, Tesla Motors opened the Chinese online design studio and order book for the Model X in China. Until now, Tesla had only allowed reservation holders in the US and Canada to configure and place an order for the new all-electric SUV, which makes China the first non-North American market to be able to order the car. In a blog post on its Chinese website, the company says it aims to start delivering the vehicle in China during the second quarter, which would mean that Tesla could be prioritizing these reservations and even start deliveries in the country before Europe. There are reasons to believe the Model X could become a popular vehicle in China, where there are significant health risks due to air pollution, which could make the Model X’s unconventional air filter an important asset for the vehicle’s success in the country. It is about 10 times larger than average car air filtering system and during the unveiling of the vehicle, Tesla CEO Elon Musk claimed it is “several hundreds time” better at filtering particles than a conventional system. He even compared the level of air quality in the car to an operating room. 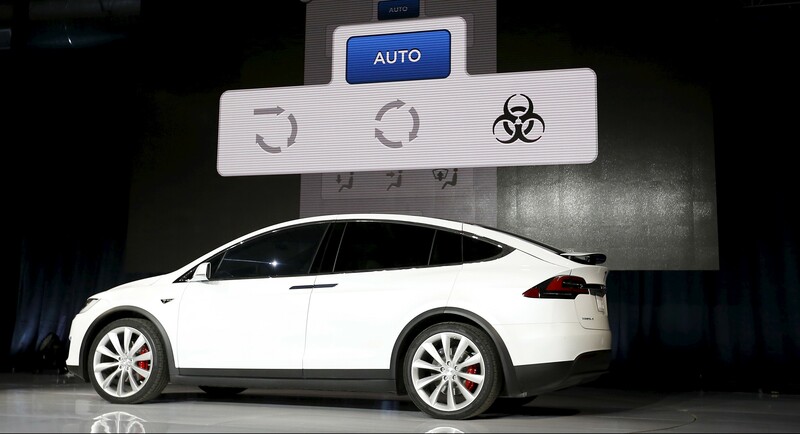 At max capacity, the system can detect any viruses or spores – making it bioweapon/apocalypse proof, complete with a “biodefence mode button”, which could be useful even when just sitting in Beijing traffic. Based on a tally, there are over 2,600 Model X reservations in mainland China and more than 700 in Hong Kong. These reservations holders will now be able to configure their vehicle and change their reservation into an order. Of course, Tesla also announced pricing in the country. Automakers, especially luxury automakers, will often add a significant premium to vehicles they import in China, but Tesla boasts a pricing transparency policy and says it sells all its vehicles for the same price everywhere after transportation costs, import duties and taxes. For the Model X in China, it adds up to 1,479,500 Chinese Yuan (~$225,000 US) for the Signature Model X P90D, while the Model X 90D starts at 961,000 Chinese Yuan (~$146,000 US). No pricing or availability for the Model X 70D has been announced for China. Even though the limited “Signature” version of the Model X wasn’t available for reservation in China, Tesla says that it will offer a limited number of the version with the “Signature Red” paint job (see picture above). The color red is linked to the Chinese New Year (Feb 8) and companies, like Apple, often offer special edition products in red for the occasion.